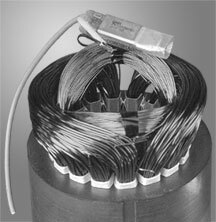 Franklin Electric supplies overloads for all of its single-phase submersible motors. However, depending on the motor design and horsepower, the overloads may be located externally in a control box or internally in the motor itself. Internal overloads are installed on the motor winding. Internal Overloads (Automatic Reset): All HP ratings of Franklin Electric 2-Wire motors, and 60 Hz 3-Wire motors rated 1 HP and smaller, utilize a single overload that is built into the motor and are identified with the words “THERMALLY PROTECTED” below the nameplate. Overloads located inside Franklin motors automatically reset. They will trip in response to high internal motor temperatures caused by high amperage and/or by inadequate motor cooling. The overload will reset automatically after a “cool down” period, usually a few minutes. At that time, if the system is still calling for water, the pump will restart. However, if the condition that caused the overload trip is still present, the overload will trip again and will continue to cycle off and on in this manner until the source of the problem is removed or repaired. 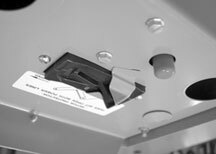 External Overloads (Manual Reset): Franklin 3-Wire motors rated 1½ HP and larger use a manual reset type overload located in the control box. External overloads trip when the current (amperage) flowing through them is in excess of what the motor can handle. On Franklin control boxes rated 2 hp through 7.5 hp both overloads are push-button reset. 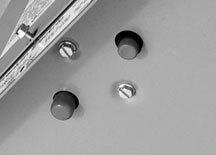 The 1½ HP control box has a single overload that protects both the start winding and the main (run) winding. This overload uses a push-button for manual reset. Note that in some cases, manual overloads may require a fairly solid push to reset. Control boxes rated 2 hp and larger have two separate overloads: one for the start winding and one for the main winding. Looking at the front of the control box, the main winding overload will always be on the left side. The start-winding overload will always be on the right side. All start winding overloads are of the push-button type. Main winding overloads are also push-button, with the exception of the 10 hp and 15 hp ratings. Those two ratings feature a toggle design. Note that these toggle overloads should never be used as a switch to disconnect power to the motor. Even when tripped they do not totally remove power from the motor or the system. Franklin control boxes rated up to 10 hp and 15 hp use both push-button (start and toggle) main overloads. Overlaods in Franklin control boxes may be checked with an ohmmeter. Testing and Troubleshooting Single-Phase Overloads: As mentioned above, internal overloads automatically reset and are not accessible for test purposes. However, external overloads can be easily checked with an ohmmeter. It goes without saying that if there is no continuity through an overload, the electrical path to that particular winding is open and current will not flow. To check an overload, use your ohmmeter to measure between the two terminals that have wires attached. Use the R x 1 scale with an analog (needle) ohmmeter. 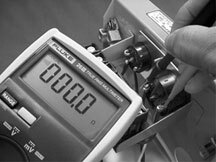 When using a digital ohmmeter, select the lowest ohm scale available. Resistance should measure 0.5 ohms or less. If the reading is higher than 0.5 ohms, ensure that the overload has been reset and then re-test. If it is certain that the overload has been reset, yet the resistance still measures higher than 0.5 ohms, the overload should be replaced. Consult the Franklin AIM Manual for overload replacement kit numbers from Franklin Electric. This entry was posted in Archives and tagged Overloads by copywriterfele. Bookmark the permalink.